Within a few hours of dropping Ariel off at the airport in Hanoi on March 15, it started to rain heavily in Hanoi. Originally, Emily and I planned to bike out of Hanoi just as we had biked in. However, we quickly changed our minds and decided to take the train to Lao Cai, 375km north west of Hanoi. 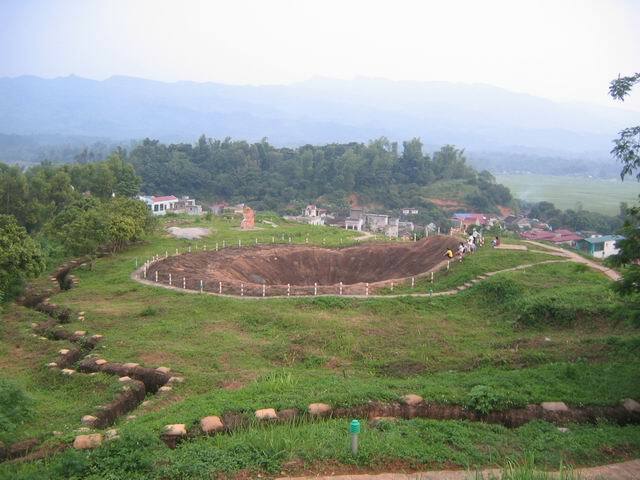 Lao Cai is starting point for most who wish to explore the scenery and minority cultures of the Hoang Lien Mountains. Since it would take about 4-5 days of biking in the rain through industrial townships just to get to Lao Cai, the train was a cheap and welcome substitute. Hopefully, it's one of the only transport cheats we make. After a night of intermittent sleep, we arrived in a rainy Lao Cai at 7:30am on March 17th. Before we left Hanoi, Emily bought us matching head to toe rain gear including shoe covers so before exiting the train we got decked out in rain gear. When we went to cargo car, we found that someone had stolen our tarp mud guards that we use to protect our panniers from mud and rain splash up from below. It ended up taking us a little over an hour to make new mud guards, cover our panniers in rain covers, and buy 2 new rain pants after my giant thighs split the first two. By 9 am were on our way up the mountain. That first day back on the bikes was absolutely brutal. We planned not to stay over night in the city of Lao Cai and instead biked in the cold rain to the mountain-top town of SaPa. Sapa was a hill-station built by the French in the 1800's to beat the heat of Hanoi. Since the expulsion of the French, however, it has become one of Vietnam's main tourist attractions as a place to go trekking and sightseeing among colorful hill-tribes and terraced rice fields. The distance from Lao Cai to Sapa was only 37km (according to the road signs) or 26km (according to mapmyride.com) but about 80% of it was a steep uphill climb (avg 7.7% incline apparently). It was too wet to take photos but we couldn't really see much anyway. The ride took us 7 hours and upon arrival in Sapa, we collapsed in our room at Cat Cat hotel while our clothes dried by the in-room fireplace. Sapa in the sunlight is much more impressive than in the fog and rain. The morning after our hellish ride up to Sapa was glorious. We rose out of bed, got breakfast, and set out on a little hike to explore the villages and sights of the Sapa countryside. Along the way, we were suckered into buying matching bracelets from Hmong hill-tribe girls aged 18 and 13 who spoke impeccable English and wouldn't let us go til we bought something. In the afternoon, the rain clouds cleared long enough for us to get a glimpse of Fansipan mountain, Vietnam's highest at 3143m elevation. We spent the evening on a double date with a married couple who live in Thailand. Against our best judgement, the date ended with us taking shots of local fermented apple wine. Pretending we weren't hungover, we decided to cycle out of Sapa the next day to shrink the 300km gap between us and the Laos border. For the first 15km we granny pedalled our way up the steepest part of the Mountain to insanely beautiful Heaven's Gate Pass - the highest in Vietnam at 2100m elevation. From there we flew down 26km of the scariest road either of us has ever ridden to the base of the valley. With nowhere to sleep we decided to press on. Unfortunately we were met with another 20km uphill climb before we could get to another town with food and lodging. Emily almost gave up, but decided to give one more push just as we crossed over the crest in the mountain and found ourselves zooming down 14km in the dark to a city. The city was brightly lit, but all the buildings were super new and empty. Virtually no one was on the street. We finally found a place to sleep at 8pm. It was obvious that T.X. Lai Chau was a very new city. So new, in fact, that according to all the maps, no city existed where we were and Lai Chau was a city 120km to the West. Over the next few days we were to encounter various directions, maps, and road signs all indicating different names for the same places. We were confused to say the least, but eventually we found our way through. From Lai Chau, we made our way to Pa Tan and then to Muong Lay. Muong Lay, is actually the new name of a place that used to be called Lai Chau. Muong Lay (or the old Lai Chau) is the Lai Chau referred to on all the maps. And Muong Lay itself is the name of another town 50km further south. As we travelled between these places, we passed through many gorges which were being dammed and it dawned on us that the old towns had been or were being flooded while the new towns of the same names were where the inhabitants of the old towns were moved to. Either way, it was beautiful scenery and a hard workout. Once we moved west of Lai Chau, it got really hot and were having to take breaks quite often. Emily's cough was getting worse and our brakes were almost dead. The last straw was when we finally reached Muong Lay and began searching for a hotel. there were signs by the road indicating which way to turn, but with the entire town being built from scratch and full of migrant workers, no one knew where this phantom hotel was. No amount of asking directions or calling the hotel helped. After two hours, we finally found the hotel on the opposite side of the river from the town perched on top of a hill at the end of a muddy steep road. The hotel itself was not even finished being built and but we had to bargain hard for them to reduce their rates. In the end our $10 USD per night room had water leakage, no hot water, a TV with no reception, and bees flying around in the room - not a good place to rest. Needing to give Emily some recovery time and a chance to order brakes, we decided to skip the last 100km in the blistering sun and head to the nearest "city" of Dien Bien Phu by bus. Another cheat, but definitely worth it considering the circumstances. Dien Bien Phu is a Vietnamese city 34km from the newest overland border crossing into Laos. It is also the sight of the final battle between the Vietnamese independence forces and the Colonizing French in 1954. The are two hills where battles took place, a few rusty old tanks, and a museum about the 57-day battle. We've pretty much exhausted what we can do to keep ourselves occupied here but have no choice but to wait out the brakes. The roads get even steep and more unpaved in Laos so we're gonna need them. Til next time, take care and be well. Love you all!